All stories have a beginning, a middle and an end. 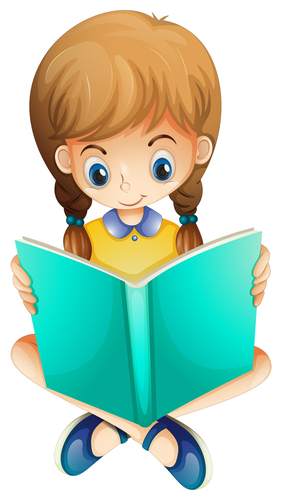 Most fiction authors write their books with that in mind, although there are probably exceptions. The idea of a beginning, a middle and an end mirrors life itself. We are born, we live our lives, and we die: fulfilment. I’ve been thinking a lot about life today. And death. Yes, I’m having a ‘down’ day. I’m fortunate in not having too many of those. I’ve always been a cheerful person. I smile a lot, laugh a lot and sing a lot – which probably irritates some people immensely. My parents were cheerful people, who sang constantly (not only in the bath!) so I’ll blame them for that. But today is not a good one for me. For a start, who could feel happy in the face of so much tragedy in the world at present? The shootings in Paris have left people around the globe feeling both outraged and deeply saddened, and it’s hard to put such violence out of mind. The weather is foul today. It’s a wonder I stayed on my feet during my morning walk, the wind was so strong. It had been howling all night and to make matters worse, it started to pour down just as I stepped outside. Yet I can’t survive the day without my walks, bad weather or not. When I got home I had a phone call to tell me that my uncle had died. He was eighty nine and had been frail for some time, but when death actually comes, it still hits hard. So I’ve been thinking about him – Uncle Bob – for most of the day, too. 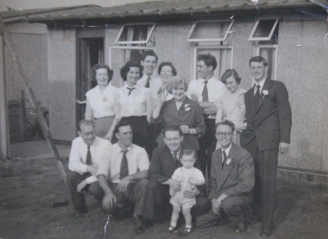 This old photo was taken in 1954, outside our old prefab. (About page). Bobby is third from the left at the back. It was his wedding day, in fact. I was to be a bridesmaid, aged seven, along with my five-year-old sister and twelve-year-old aunt. When the photo was taken we were getting ‘dressed up’ inside the house with my mum. Bobby was my mum’s brother, six years her junior. I haven’t seen much of him these past few years because he’s lived all his adult life in Southport (Merseyside) – which is my home town. Originally from Liverpool, like my mum, he never lost his Scouse accent. He had a happy life though, and died peacefully in his sleep. I’m trying hard to dwell on the good things in my uncle’s life and I know that my depression today is natural on receipt of such news. My main thoughts are with Bobby’s four children, my cousins. Beginnings, middles and endings . . . Birth is a most wonderful thing; a new life to start on its journey – whether it is a human child, a terrestrial animal or marine, or a member of the vast plant kingdom – the journey through life will take its course. Many parts of the world are now experiencing hot, summer days, whilst more northerly latitudes are in mid-winter. In Britain we are fortunate in having what are classed as mild winters and warm summers, i.e. with a few exceptional years, we have no extremes. Apart from the few cold days just after Christmas we’ve had a mild winter this year, so far. Even though today is quite wild, it isn’t too cold. But it’s always heartening to welcome the first signs of new life in our gardens. It gives us the feeling (often erroneously!) that spring is on its way. Here are a few photos, taken today, of our first lovely snowdrops and hellebores. There are also some daffodils already in bud – which is very early! So our garden will soon have some colour other than the green grass and evergreens. Soon we’ll have the purple crocuses and yellow daffodils opening, followed by the bright red tulips and a whole array of blossoms on the trees – lilac, cherry, willow, hawthorn, maple, and many different fruit trees and bushes. In summer we’ll have a riot of colour from so many flowers and shrubs. Then by autumn the garden will again fade and winter will follow. The earth’s cycle never ceases. The phrase also has my mind racing about my third book. I’m already enjoying the challenge of a new beginning and have spent a lot of time on it this last week. The book is planned out fairly well, although I still need to do some more research for one particular part. I love doing research and have to take care not to let it lead me in all directions. But today my mind’s on other things.